Today De hosts the Quadrille at dVerse. Write a poem in exactly 44 words that has to include the word free in any form. Join us at 9 PM when the bar opens. Funny, you chose today (9/11) for this theme, So many freedoms have been lost. “buoy or burden” is gonna stick with me. And the metaphor/image of the albatross. Perfect. Metaphor… there’s a hint of things to come there. Oh, this is interesting. I was struggling with thoughts along these lines, but couldn’t articulate them into a poem. I like this very much. Albatrosses are bloody big birds, they would be a massive burden. Let’s hope we can fly with them, instead. Brilliant link to the ancient mariner…I can never read the word albatross without hearing the Monty Python sketch in my head though. I like your reference to the Ancient Mariner. Buoy or buden – such is many things in our lives. Much to think about in this wonderful small poem. I like how you have framed the albatross. It is our perception that shackles us or gives us freedom. I had to read this several times and for so many freedom seems to fall between more than two stools – yet everyone can choose internal freedom when they are strong enough. Freedom leads to even negative choices. It’s just the ability to make those choices, even those we don’t deliberate over. “ancient mariner” yes, I feel this…and also the freedom for everyone and what is happening in our world today. 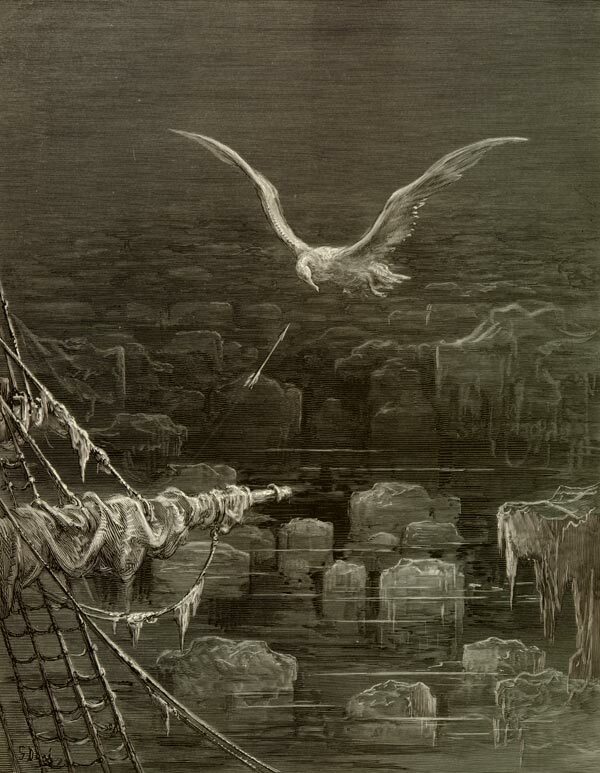 How fitting that you have paired the illustration from The Rime of the Ancient Mariner with a song by Sting! or shoot and tie around your neck’. A favourite poem of mine that I loved to teach – lots of scope for drama and multi-media activities. I like thinking about the idea of freedom as being a gift to give. What a success among friends the person who mastered that would be! Love your pairing of poetry and song. Perfect match. Very nice – love the image of the albatross too. “buoy or burden”.. ah, which really is it? What do we do with our freedom – selfishly or selflessly – apply it to life. buoy or burden indeed. You got it right. “Saving yourself at the expense of others”. No freedom there. The image of the albatross, creates the mist of darkness circling around your words. Is the price worth the pain of others? Such a good analogy. Freedom is a paradox because with it comes great responsibility.